As a food blogger, sometimes I get, well, food to sample. And drinks. Not long ago, I received a package with Voga wines and Sparkling Ice Lemonade. The idea is that you'd make a wine cocktail using the wine and the lemonade. And presumably something else. But after trying the wine and lemonade together, I didn't think it needed anything else. It was pretty tasty just like that. On the other hand, if I was serving this to company, I'd probably have some lemon or lime slices as a garnish. Or maybe some cherries on a skewer. Wine cocktails can be potent, or they can be light, depending on what you add. In this case, the cocktail is very light, both in alcohol content, and in calories. The Ice lemonades are calorie-free, so they don't add calories to the drink. And obviously, adding a non-alcoholic beverage to the wine lowers the overall alcohol content. Add some ice, if you like, and it's even lighter. The Voga wine was nice all by itself, and I have to say that I liked the bottle design. Yes, you shouldn't buy a wine because of a bottle. But it is different. And fun. The bottle is sealed with the cork, but it also has a screw-on cap. 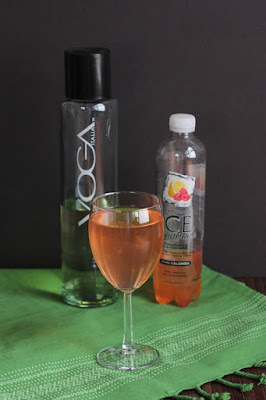 This combo would be fun for a party, either pre-mixed, or as a mix-your-own bar, since there are several flavors of the Ice lemonade and of course there are a variety of wines. This would also make a nice gift item or hostess gift. Who's it for: Wine drinkers. Lemonade drinkers who'd like a little fizz. Pros: Nice wine, unique bottle. No-calorie lemonade. Cons: I know some folks don't like no-calorie beverages. I generally don't drink them, but unlike some, this didn't have a weird taste that I've detected in other brands. Wishes: None that I can think of.